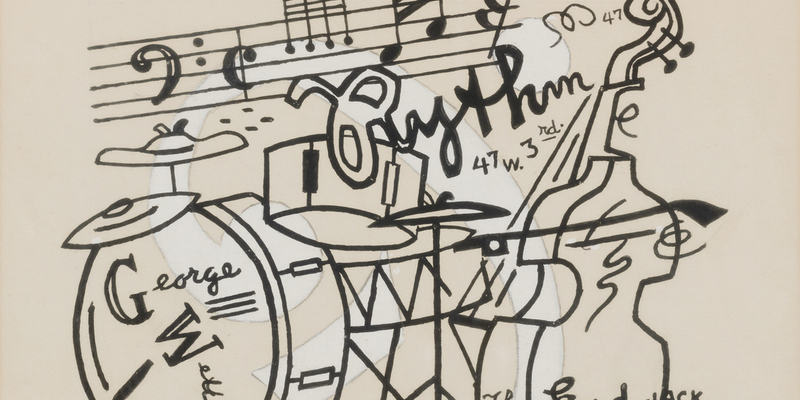 Stuart Davis, Rhythm—George Wettling, 1947, gouache and pencil on board, 13 x 16". Maybe that thin, high trumpet is coming from Eddie Condon’s jazz club, which used to be located on West Third Street in Greenwich Village. Its address can also be found in Rhythm—George Wettling, 1947, Davis’s tribute to the titular Dixieland drummer. The show’s title, “Lines Thicken,” refers to a kind of sonic texture found in jazz, where a melody is shadowed in close harmony. Formally, this exhibition is full of such moments. Davis’s lines come together and branch out like urban streets, taking swooping, angular detours. Images such as musical staves, clefs, and notes mingle with cityscapes, boats, buildings, chimneys, fish, flowers, and even an armchair in a sort of interior-exterior cartography. His strokes are so rewardingly bold and sure, but on occasion we can see the faintest of hesitant, whispery pencil traces—they feel like a benediction.